Madiha grew up listening and speaking Urdu with her parents and oldest brother. Urdu is a connection for her family to where they come from, her family history and background is rooted in a culture and traditions from a different place. Language is her way of connecting with that culture and family history – it acts as a bridge. 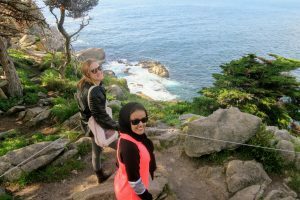 Listening and speaking “Urdu-lish” at home, a combination between Urdu and English, provided Madiha with a strong foundation to build from when she arrived at MIIS. That does not mean she hasn’t been met with many challenges in her pursuit of language learning. Initially, she had to break through the assumption that being able to understand and speak at home with family would make it easy for her to pick up reading and writing in a more professional setting. Before arriving on campus, she spent a year self-teaching basic Urdu language skills in preparation for the intermediate-level classes she takes now. She has also learned to be confident when speaking, even when speaking with native speakers who may be able to identify her errors in pronunciation and vocabulary usage. She also faces questions about her future career in national security or in the CIA because of her second language choice – neither is included in her career plan at the present moment. One-on-one instruction from her professor provides tailored, individualized language learning with Madiha at the center of it all. Her degree program at the Institute is International Environmental Policy and her Urdu classes cover complementary material to round out her education. Working with her professor, Madiha is able to read news articles in Urdu and understand different perspectives than those presented in other classes. She works with her professor and teaching assistant to develop her reading, writing, listening and speaking skills in preparation for spending a semester abroad in a Urdu-speaking region as part of her education. Urdu is opening doors for Madiha in a variety of ways. In her words, language holds ideas and sharing language allows for deeper connection between people. It opens doors to connect with people on a more personal level, even from across the world. Understanding language also opens doors to understanding different perspectives that cannot always be translated. Translation often hides individual voices but sharing language allows you a chance to better understand individual experiences. Urdu has given Madiha new perspective and revealed some of her biases related to environmental policies and their implementation around the world. 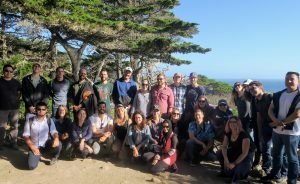 Remembering to listen to the voices of local people working for environmental protection and advocacy. She says she hopes to work on policies someday that leave politics aside and focus instead on the voices of the people. In her pursuit of environmental awareness and protection , Madiha is simultaneously cultivating a passion for people. She says there is a sense of complacency when it comes to protecting the environment that we all need to work to resolve. Urdu has been key in broadening her perspective and opening opportunities to engage with people beyond her family unit in the language she grew up hearing.